Cue the music, the Bride and Groom are entering the room… the atmosphere is buzzing with excitement, smiles and love for the newly married couple. Beautiful twinkling fairy lights gently sparkle and shed romantic light as the two soul mates take to the dance floor for the first dance. If you like the sound of that dreamy wedding, you’ll love the look of the gorgeous Fairylights invitation from Flourish & Lace! Pretty, subtle and totally romantic, the Fairylights design has a magical charm about it that will get your guests counting the days down until your wedding day! Different sizes of circles coloured in soft shades of pink, blue and yellow on five delicate lines create the delightful fairy lights that take centre stage in this design. This invitation oozes an effortless and elegant feel which would fit in well with any wedding theme, thanks to the range of colours and simple design. Your names will be written in a graceful font, standing out amongst your wedding information that has been printed in a clean looking, modern typeface; all printed in a light shade of pink, the wording ties in beautifully with the fairy lights above. The positioning of the text to the right of the invitation is a lovely change from the perhaps more traditional wedding stationery designs that are available. 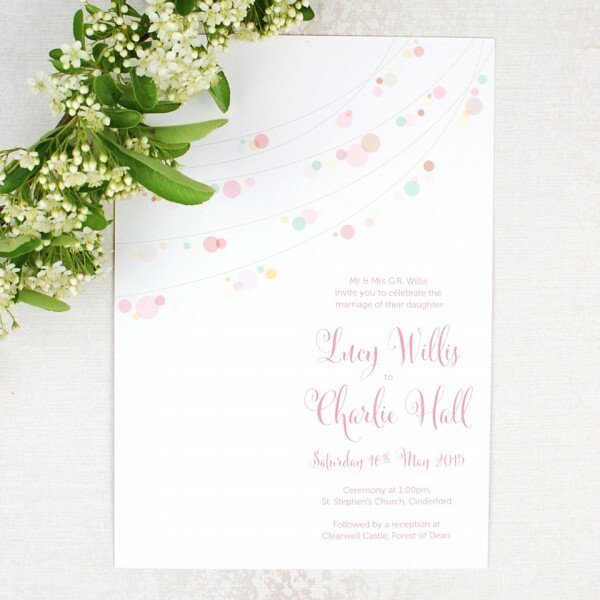 The Fairylights wedding invitation is a charming, sweet design that will make a wonderful addition to most weddings given its versatile colour palette. Check out the design on their website for some other colour options and some gold glitter lined envelopes which are to die for.